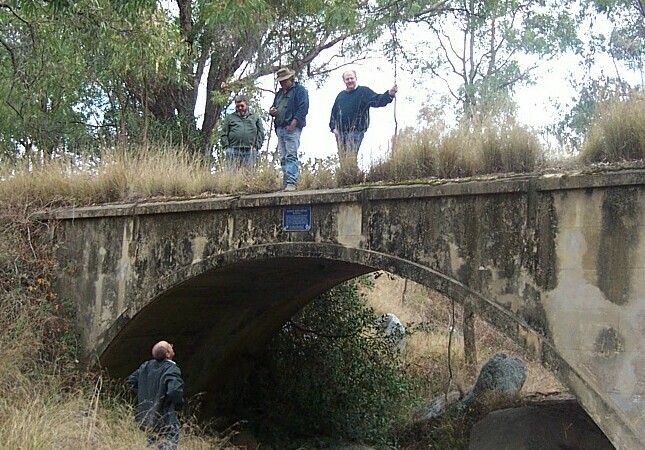 Old Bridges on the Moonbi Range. Perhaps you might like to have a look at some vintage bridges while you are in the area, whilst experiencing the wonders of Moonbi's Gravity Hill. 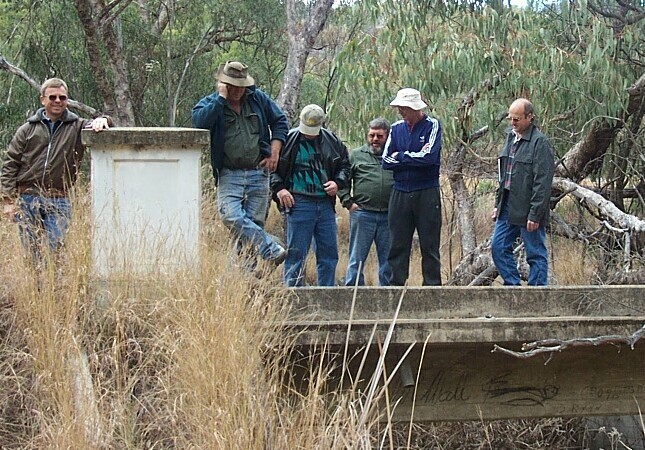 Before you reach the Gravity Hill you might like to pause to view one of the first Monier Arch Bridges built in NSW. This bridge has now been bypassed by the new highway and is located just 5.1 km north of Moonbi and 1.83 km North of the start of the divided road section of the highway. Pull offthe roadjust before the second metal safety fence on the left hand side of the road. There is room for a car or two to park off the road but please take care. The bridge is located about 30 metres to the left of the safety fence, spanning Reeds Gully. You will need to search for it. There is a memorial plaque on this bridge giving its full history. This bridge was built in 1909 and at the cost of four hundred & six pounds, eight shillings & sixpense ($820.05). It is made of cement mortar reinforced with steel bars. This was found to be cheaper than using buckled plate or "Perishable Timber". It remained in service until 1937. Please be careful where you walk. Our Parry Shire Council has the construction of a walkway on its agenda, but it may not be completed when you visit this area. Continuing on up the hill you will come to a sign indicating the Moonbi Park & Lookout 1 km to the left. By all means visit the Lookout. The Gravity Hill road, however is actually opposite this turnoff and you will need to turn to the right off the New England Highway or, after visiting the Lookout, return down the hill and cross the northbound lane (with caution). The short road ( .05 km) in front of you is Moonbi's Gravity Hill. While you are there, you might like to take the time to visit another historic Monier Bridge. Simply park your car on the Northern side of the Gravity Hill road beside the RTA gravel dump and walk 300 metres north along the rough bush track, over a washaway and past the large earth mound and you will come to an old road. Follow this along to the bridge. This bridge was constructed in the early 1930s and served the huge amounts of traffic travelling north and South until it was bypassed in the late 1970s. The significance of this bridge is that it also is a Monier Built Bridge and was constructed using, the then new method of poured concrete on site, reinforced with steel bars. It is not an arched bridge. If you visit this bridge in late summer, carry a bucket with you as there are a large number of Blackberry bushes growing alongside the track and their fruit is delicious. The bridges have not been officially opened to the public and so anyone visiting them do so at their own risk. Neither bridge has safety rails or any form of security. Children especially should be carefully watched as the ground is uneven and there are many potentially dangerous areas, especially on the bridges. Snakes and spiders, Kangaroos and all sorts of wildlife is likely to be encountered in the areas surrounding the bridges and their access paths.